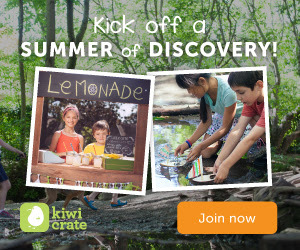 I’m excited to share that Kiwi Crate is offering a limited Kiwi Crate Free Trial. From now until June 10th, they are offering my readers an opportunity to try a sample-size project, Rad Rockets, from one of our popular crates! Just pay $3.95 for shipping. This would make a great gift to put up for later or something fun to do over the summer!